Late evening bus change visit. Could not face the beer range offered so enjoyed a sugar rush from a banana cider instead. Late night bus change visit. Late evening bus change visit. Late evening bus change visit, extended by getting into a good conversation. Late evening bus change visit. A Middlesbrough fellow had just won three £100 jackpots, in £1 coins, on three different fruit machines here. Evening visit until just shy of midnight, extended by meeting up with a Scoopgen king and his local pub and beer latest news briefing. Extended late evening bus change visit. Reunion - True Zeal 4.30 Not Tried It's gotta be a newer cask than previously seen, please help and confirm! Reunion - True Zeal 4.30 Not Tried Still on sale! 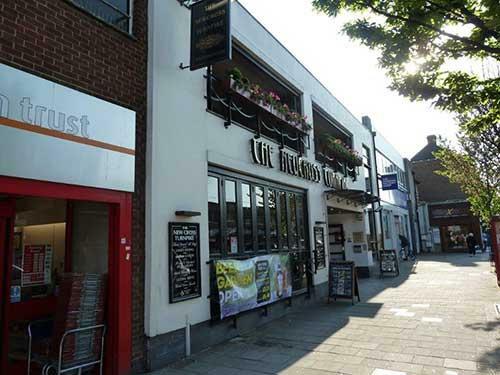 The pub is found in Welling, Greater London, DA16 3PB. Ex retail premises (NatWest Bank) in Bellegrove Road, decent and typical conversion, airy and on a number of different levels which includes a balcony area. Equipped with 2 banks of 6 handpumps. Re-opened in February 2016 after a fire over the autumn bank holiday in 2015. We have visited this pub 116 times, seen 304 different beers and tried 106 of them.